The Werner Fiberglass Podium Ladder (Model # PDIA04) has a sturdy platform and secure guardrail to allow you to work safely in all four directions. The ladder has the same reach height as a 6’ stepladder. Type 1A ladder with 300-pound load capacity. Guard rail has tool holders and a magnet. 4’ podium height, 87” overall height. 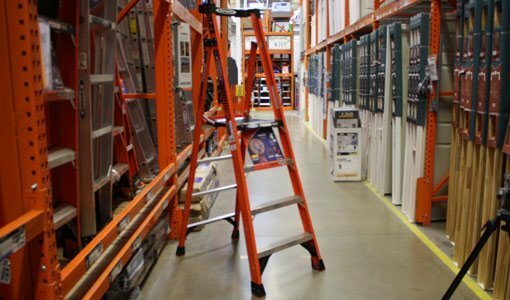 The Werner Fiberglass Podium Ladder is available at The Home Depot. Watch this video to find out more. Jodi Marks: You know, no matter what your project is around the house, there’s probably a ladder for that. Whether you’re cleaning out the gutters or getting on your roof, you’ve got an extension ladder. Or you’re just wanting to put things higher up than you can reach, you’ve got a stepstool. What if you’ve got to work around the house, and you’re going to be working over your head, like putting in a ceiling fan or things like that? Take a look at this. This is the Werner podium ladder, and I just love this bad boy. Look down here at the bottom. It’s got wide bracing, so that it’s very sturdy. And up here you have a large platform area for your feet, so you’re not just standing on the top rung. So I’m going to go upstairs, and we’re going to see what’s up here that I like to talk about. See, look at this. I’ve got now four times the range when I’m working on this ladder. So I’ve got my area here that I can work. I can then turn and work here if I need to, or if I have to work over here and over here, all without moving my ladder. And I’ve got a little storage place right here. This, of course, creates a guard. There’s also a toe guard so my foot doesn’t slip off. But I can hold my tools, and it’s got a magnet, too, so I can keep my bits there. So this is just a great ladder all the way around.